It took Anakin years to make himself Darth Vader, for these guys however it just took 118 cups of flour and 2 gallons of milk. 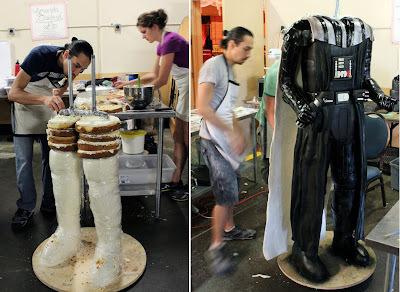 Remember that life-size Stormtrooper cake a few months back? Well now Amanda Oakleaf Cakes are at it again, this time for the Star Wars Celebration IV convention. Only this baked and sculpted Darth Vader can enlighten you on the dark side of vanilla - behold! 500 pounds, six foot seven inches tall, this 386 egg cake of pop culture's biggest bad is backed by a cape of marshmallow fondant, that actually hangs without touching the floor! The lightsaber is poured sugar with watermelon flavouring, and if you ask me there's the touch of true evil right there. Never did like watermelon - devil's stuff. To see more photos of Vader's edible creation and his disembodiment (as people take him apart in ways Jedi's only dream of), visit the team at Amanda Oakleaf Cakes for more photos, after the jump! 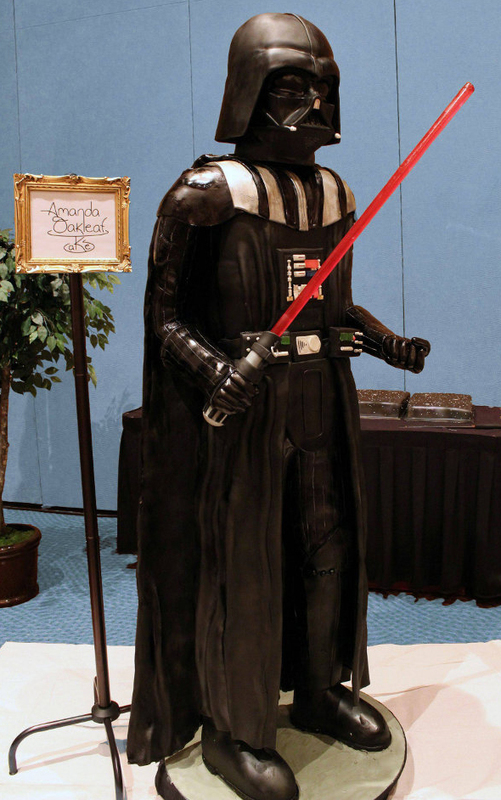 In here we have a chocolate fair every year and I had seen a life size Chocolate Dart Vader, first cake though. Chocolate fair in Obidos Portugal in the end of the summer. All kinds of chocolate fountains, Sherry in chocolate cups,profiteroles,fruit and chocolate fondue. Cups of chocolate and strawberies and all kindsof "traditional" harder chocolate.That gained me my firstborn's first tantrum. My family does love chocolate LOL! Yes, the prices aren't that friendly.